What is the unique Khorezm land? Of course, an abundance of unique architectural monuments that tell a centuries-old history. The government of Uzbekistan takes proper care of their preservation – that is why in March 2013 a document containing points for the development of tourism in the Khorezm region, covering 2013-2015, was legalized. In one channel, the Cabinet of Ministers also works, which has developed and approved new tourist routes, as well as those activities that will have a beneficial effect on the development of the tourist sector. The Ichan-Kala complex, which is a UNESCO site, is represented by many tourists as the most significant architectural monument, called only the heart of Khiva. The complex represents 400 residential buildings with national monuments located between them, well preserved until our time. There is also a summer cinema, from the screen of which famous and beloved works are broadcast. Invites in the palace ensemble Tosh Khovli drama theater Ogahiy, which prepares for its viewer two completely new productions of Makhtumkuli, Dilda borim. We can not forget about the state reserve, where many festivals are held attracting visitors from all over the world. This festival is the Culture of Khorezm, the Republican Fair Uzbekistan Travel Workshop-2013, the contest “Bakhshi Shoilarar, Okinlar va Halfalfar, on the approach of international Folk Dances and the Puppet Festival. 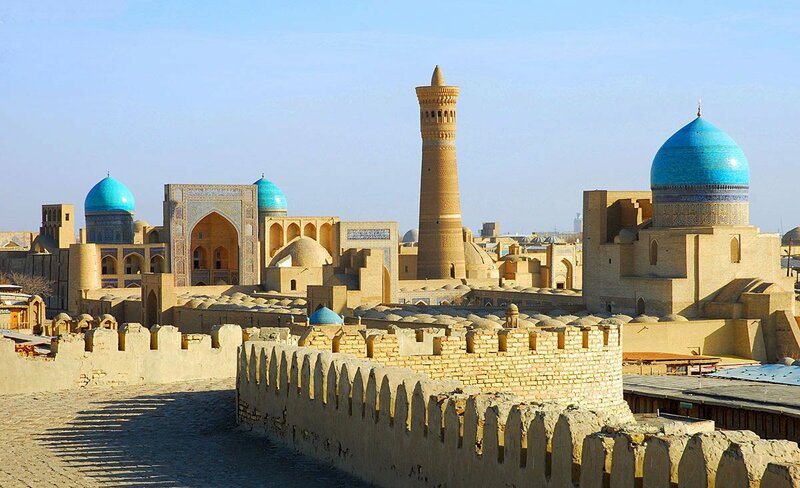 Madrasah Allakulihan offers to get acquainted with the creativity of the ethnographic ensemble of the people of Khiva, serving to the delight of the audience every evening. Lovers of quiet hunting can visit Ashon Ravot – there are yurts near the lake, you can also fish. If the evenings are cool, then the guests will always be welcome in the local teahouse, famous for its excellent Uzbek cuisine. Visiting the Bibi Khozhar museum or the palace complexes of Chodir, Muzhon, tourists are given a unique opportunity to plunge into the world of several eras. Honored recognition was won by Urgench airport, which today meets all modern standards. Transit zone for two hundred people, equipped medical center, comfortable room for mothers with children, rest rooms, VIP halls. And also – numerous shops and cafeterias. The local transportation network is also well developed – the railway lines cover all large settlements, and the cars differ in terms of comfort, including the chic restaurant car. Also common are flights and cutter routes.